Filamentous algae has the appearance similar to that of stringy hairs or cotton. This type of algae grows in long chains or threads. 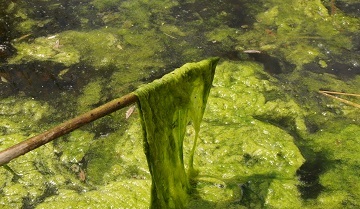 When there are large amounts of filamentous algae it is often described as looking like wet wool. It tends to grow along the bottom or attached to things such as rocks or sticks. Oftentimes the algae will become detached from what it was growing on and float along the surface of the water like a rug.